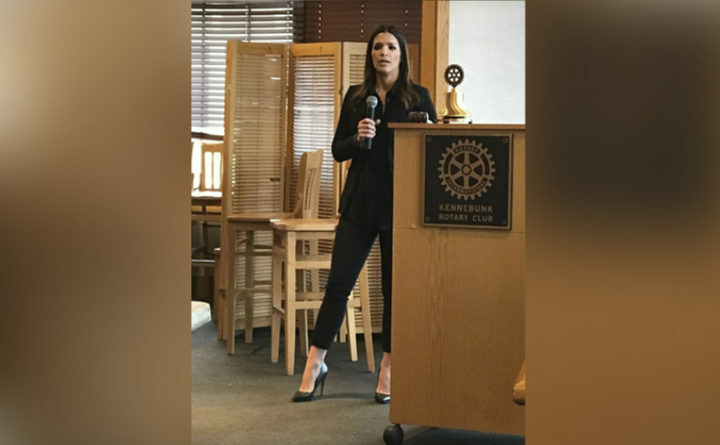 Katie Rodrigues tells the Kennebunk Rotary Club her story of addiction and recovery as a high school track star who became addicted to opioid drugs and heroin. Katie Rodrigues’s seven-year battle with addiction at times cost her everything she had — her freedom, her health, her family, and nearly her life. Rodrigues recently told Kennebunk Rotarians her honest, raw, and heartbreakingly harrowing story of growing up as a normal, high-achieving high school student, who is now a recovering heroin addict. Kennebunk Police Chief Bob MacKenzie has launched a Rotary Recovery Initiative task force bringing Rotary clubs together to work on reducing the stigma of substance misuse and create resources to help with long-term recovery. He invited Rodrigues to speak as part of that effort. “The work that we are doing as Rotarians with this recovery initiative, we are going to help a lot of people. There are a lot of people struggling, but there is a lot we can do for them to give them hope for recovery,” MacKenzie said. She grew up in a loving family with both parents, who were teachers, and her sister. She moved to southern Maine four years ago to be closer to her parents, who now live in Kennebunkport. Her brutally honest account of life as a heroin addict put a spotlight on the efforts MacKenzie and fellow Rotarians are working on to remove the stigma associated with addiction. “This is not a back-alley problem. This is in our schools, our neighborhoods, these are people’s loved ones, people we all know, dying every day,” MacKenzie said. There are a lot of people who don’t want to talk about these issues that are going on in our communities, because it’s not a pretty thing, Rodrigues said. “Nobody wants to talk about drug addicts, it’s ugly. But they don’t look like junkies on the side of the street. They’re not all homeless, dirty, smelly people. They’re kids in college and in the suburbs, and it is everywhere and it’s killing today’s youth. About 155 people die each day due to drug overdoses, and I am a survivor of that, I’m a recovering heroin addict,” she said. Rodrigues was, by her account, a good kid — a typical, normal honor roll student who liked school. She was a rule follower. She ran track and cross country in high school and discovered a talent that lead to a full college scholarship to Liberty University. At 16, she had rhinoplasty surgery to fix a deviated septum from a broken nose, and was prescribed opioid painkillers. “It was my first experience with narcotics, and even though they were prescribed, it was the beginning of a very long journey with drugs,” she said. She had a few additional surgeries on her nose, and through that continued exposure developed a love for painkillers. By 2004, at age 19, Rodrigues was a full blown addict, and she said nobody in her family had any clue. She doctor shopped, going from hospital to doctor’s office, to ER or walk-in clinic, researching ailments ahead of time that would lead to a new prescription. There were no prescription monitoring programs in place at that time, so she could easily go from one place to another to abuse the system. “It’s a very strong narcotic, and I fell in love with oxycontin. It was the next step in my progression,” Rodrigues said. She dropped out of college and moved home with her parents, who still had absolutely no idea what was going on with their daughter. “I was very, very good at hiding what I was doing,” she said. It was then that Rodrigues ran out of sources for her opioid drug addiction, and progressed to heroin. “I was barely 21 years old, living in a beautiful home, in a beautiful neighborhood with a beautiful family and I had a beautiful life and I willingly and knowingly — I knew exactly what I was doing — I went out and started using heroin. That was my answer at the time. That was my only option at the time to keep myself from becoming physically ill. And I became a heroin addict,” she said. Her parents became aware of her problem and knew she needed help. She accepted their help and was enrolled in a recovery institute in Manhattan, New York, where she got clean along with celebrities and their children. She got a job and enrolled back in school. She thought the “phase” was over. But she was still dabbling in drugs when she went out with friends, and quickly relapsed. IV drugs were the next step, and as she began to shoot heroin on a regular basis her parents began to wonder where they went wrong, but still offered their support. Rodrigues said that’s when she began to refuse their help. Her addiction had become so bad that she was no longer willing to go to rehab. “I loved getting high, and I didn’t care how it affected my life negatively. As long as I had drugs, I was going to be ok,” Rodrigues said. She lost her home, family, job, car, credit, money — all of it went out the window. “I voluntarily gave it all away because I could no longer function without heroin,” she said. She was 23 years old and homeless living in Danbury, Connecticut. She said her parents had to show “tough love” and cut her out of their lives. A turning point came for her when she was arrested for stealing a candy bar, and because she became violent with the store owner when he tried to stop her, went to prison for robbery. Part of her sentence was a six month court-ordered rehab. She got clean, and stayed clean. She went back to school, and most importantly reconnected with her family. Prison made Rodrigues want to try to stay clean and move on with her life. She stayed clean until about a year into her three-year probation, when she went to the dentist to have a tooth pulled and was prescribed Percocet. She had taken it all in two days. Rodrigues relapsed again, and violated her probation. The judge ordered her back to jail, but instead, she said, she went on the run. She was living on the streets in Hartford, Connecticut, with warrants out for her arrest, and ended up using heroin that was cut with rat poison. “I shot it, and I blacked out. I woke up in the hospital 24 hours later, and I was lucky I survived,” she said. The poison left her body ravaged with chemical burns inside and out, and she was unrecognizable to people who knew her. She still bares the scars today. “I remember feeling like my life was over. My rock bottom had a trap door in it, and there I was,” she said. Because of the active warrants, the police arrived at the hospital and took Rodrigues to jail. She served 19 months of a three year sentence. During that 19 months in jail she got clean, and did a lot of soul searching and self-discovery. When she got out, she decided, finally, to fight for her life. Her parents came to Kennebunkport every summer when she was a child, and while she was in jail they both retired and moved here. Her mother was a middle school teacher and interior designer, and her father was a high school teacher and owned his own company. “They were at peace and had gotten away from all the chaos I had created in their lives,” she said. They welcomed her when she decided to join them in Maine four and a half years ago, to start her life over. Rodrigues said today her parents are her best friends, and are amazingly supportive despite everything she put them through. Today, Rodrigues has a job, and she is the co-owner of Woodgrain Barbers in downtown Biddeford. She has her life on track, she’s been clean for years, and is grateful for every single day, and the opportunity to start her life over again. She volunteers actively with MacKenzie speaking to Rotary clubs and school groups, and works with recovering addicts at Crossroads in Portland. She said she gets more out of it than she gives.